A powerful month. Having reached many goals before December, I decided to raise the bars to challenge myself further. I was within 20 miles of my original goal of 365 miles in 2015 so set a new goal to reach 400 miles. Inspired by the streaking success of MT, I just tried to get out as often as possible and run (usually at least 3 miles). I spent 10 days in the midwest for the holidays and got out for several delightful runs on both familiar and new streets and trails. I reached 400 miles by Christmas Eve and didn’t bother looking back. I looked at my totals on Dec 30th after my run and realized I could make it to 75 miles in the month of December if I ran 7.5 miles on New Years Eve. The whole thing felt auspicious and I couldn’t resist. The run was long and cold but was so amazing. At certain parts I focused so intently on my feet and my breathing the world seemed to melt away. At other parts I reflected and thought about my year and my future and barely noticed as the sidewalk moved under me. 75 miles in a month is most certainly a record for me, and one that gives me obscene amounts of courage and inspiration. 2016 is going to be remarkable. I can feel it. September was spent prepping for the a 10k race on Sept 27th. I enjoyed the last vestiges of summer and evenings without headlamps. I returned to work which didn’t slow down my running and I had a terrific race to cap the month. I added another 38.6 miles bringing my yearly total to 272.6, and completed my only 2015 race longer than a 5k. October had a slow start and my consistency wasn’t as good over all, but I got out for 11 runs. I have been working through some pretty bummer life circumstances and it made it difficult to find the energy or drive get out the door. My race for the month was the Everyday Super Heros 5k and achieved a 5k race PR! Despite my low emotional and physical energy I was still able to squeeze in 28.2 miles to make for 300.8 miles total in 2015! When I returned home from my trips at the end of July, I promptly got a nasty strep throat which put a huge damper in my early August Runs. I was couch/bed ridden for days and even with an antibiotic, it took a full 10 days to recover. I was immensely bummed but focused on healing and recouped thanks to the care-taking of Mr. and MT. I searched around for an August Race I was interested in and just didn’t find one that made sense. 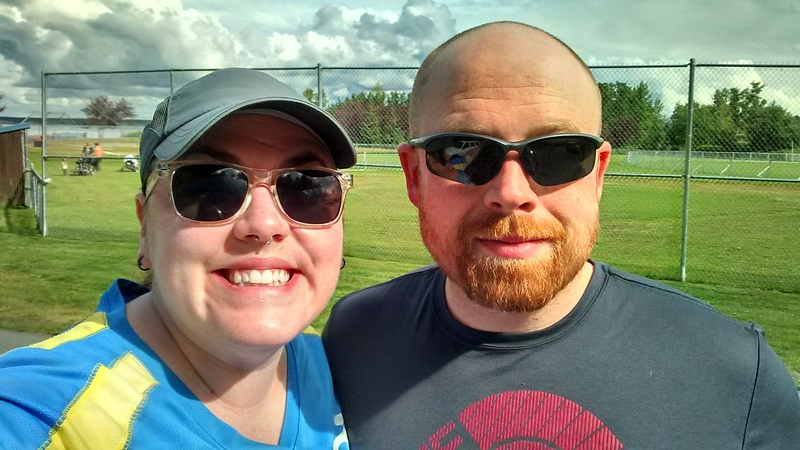 After running two races in July (and previous months), dealing with sickness in the first weekish of Aug, and moving to a new place, I decided to not have an August race. 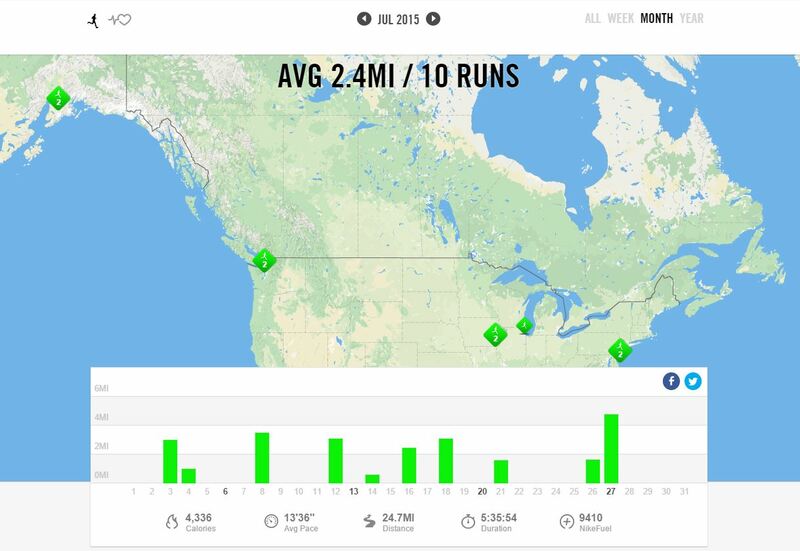 July was a bit more steady in terms of running. Even on a three week vacation I managed to get in regular runs. I love running when I travel because it gives me a new way to see the location. I enjoy looking up routes, checking out local running sites, and then mapping out a place to go. I started my vacation in Anchorage where Mr. and I ran the Boondocks Breakaway 5k. It was a memorably difficult race as we’d arrived the day before and had Opening Night festivities with friends the evening before the race. After Alaska, I flew to Chicago where I got in a jaunt through my childhood neighborhood. Such fun to see the changes to the streets and houses while plodding along. My Dad’s garden was in fine summer form! Next, my dad and I drove to Iowa to see my sister and her family. While there, I couldn’t pass up the Solon Beef Days 5k. Beef Days. Yup – I was cracking up when I heard about the race and it was a short drive from my sister’s house. It was quite the adjustment to run in the heat and humidity of Iowa summer. It felt like running through pudding the air was so thick and hot. My big sis was a champ and major kudos to Solon for having a rad trough. All I ever want to eat after a race now is watermelon. Perfect. While in Iowa my runner brother-in-law suggested a trail at Harvest Preserve. It was a beautiful shady trail but ended up being half hike half run. There is an impressive sculpture collection at the Preserve so I kept stopping to check them out – also, I was clearly the first person there that day and had to contend with the plethora of spider webs across the trail. It was early, but hot and this pic is me with sun and sweat in my eyes. The final stop on my trip was the Philly area to visit my brother and sister-in-law. They live near a cool two path on the Delaware River so I made my way along that canal for a nice 5 miler while I was visiting. I tried to find a race in the area but the only options were a 45 min+ drive and I just didn’t want to loose that much time with family. The two path was half shady and nicely maintained. There were locals fishing in the canal, bikers riding by, and families walking with strollers. It was sparsely populated though so the run was quiet and beautiful. While I am proud I continued to get some runs in while on vacation, I didn’t’ quite get in my full monthly mileage as I’d hoped. Still, I ran 24.7 miles in 5 different states and completed two more 5k races! What started off as a rough cold turned into sinus infection and bronchitis. Needless to say, with that much chest congestion, breathing issues, and energy sapped, I was not a running machine. When I get sick like that it sinks my spirits and I get frustrated beyond belief that I cannot be doing the things I want to be doing. When I picked back up my running mid-month, I was still trying to take it a little easy on myself. I got in the June race – Camano Island Crab Dash 5k, and finished the month with 24.5 miles. Respectable considering the circumstances. 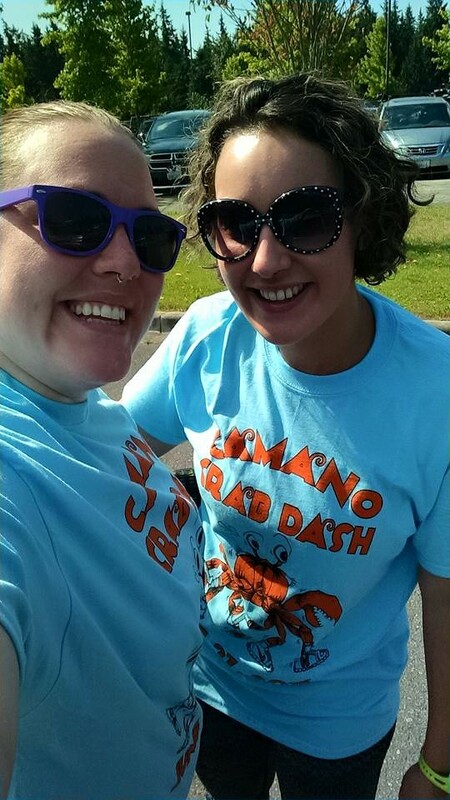 Last weekend I ran the Camano Island Crab Dash 5k! It was a beautiful hilly run with a great crowd. There were less crab costumes and hats than anticipated, but the runners were kind and encouraging. Locals came to the road to cheer folks on, and the race organizers did a fantastic job of course marking, water stations, and support after the race. This was a local gem I will most certainly do again! The ever-inspiring MT did the 10k and tackled a nasty hill at mile 4-5 – called King Crab Hill. I was not sad that the 5k didn’t head that direction. We had some nice ups and downs but nothing traumatic. Here we enjoying the pre-race shade. The race shirts are so good: a cartoon crab with a different brand of running shoe on each leg. Adorable. Post-race and feeling accomplished, we changed out of sweaty gear for the ride home. We stopped at Salt & Thistle Provisions in Stanwood to celebrate their grand opening where we met the Stanwood mayor, grabbed some presents for our families, enjoyed delicious coffee, and split the best carrot cupcake I’ve ever had. We also couldn’t resist taking home some cinnamon rolls right from the oven. What a fabulous June race! Well, it had to happen sooner or later. I’ll come right out and say it: I did not make my monthly goal in May. But but but… as you’ll recall, I’ve banked up some extra miles over the last few months so I am still on track for my goal. I got very close but illness and house guests and the end of the academic year all came barreling down on me in the last week of the month. In total I logged 29.1 miles in May and ran one 5k – the Haggen to Haggen. I was still super sick with the death cold until mid-June, but after some antibiotics and the end of the academic year I was able to get some rest and I’m back at my running now. I certainly have some lost mileage to make up for in the next few weeks but thankfully the weather has been perfect and I am feeling motivated.